This weekend I made my first attempt at weathering rolling stock using acrylic and enamel paints, Bragdon weathering powders and Testers Dullcoat. The hopper is an Accurail kit and it took about 4 hours from initial kit building to finishing up the weathering. This is an Airslide Center Flow (ACF) Kansas City Southern (KCS) hopper that was put into service in 1994 and is showing it's 15 years of use on the rails. One down and 200 + rolling stock to go... Here is the before shot... The image below is a High Dynamic Range Image (HDRI) and it is meant to approximate an early morning splash of orange sunrise. This is the After shot... Here are a few more images with some other weathered rolling stock too... I also started a renovation on my grandfathers old Rock Island Pulpwood car. This piece of rolling stock is the only known surviving piece from his old HO layout from the 1950's, he took it down in the mid 1960's and donated it to a local Boy Scout troop in Alexandria, LA near where he lived in Pineville, LA. The decals had long since fallen off and it has some peeling paint and such, so I took the load off and sanded down the peeling paint, removed the trucks and repainted the shell. 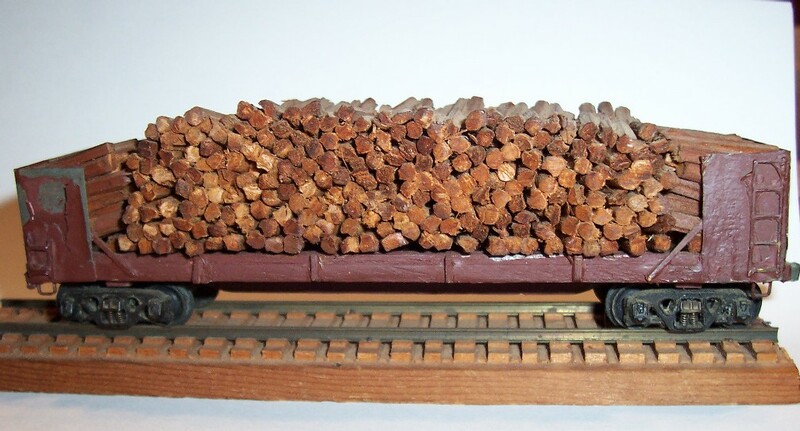 The pulp wood load is a bunch of old wooden matches that were cut to about 5' to 5 1/2' HO scale lengths and stacked and glued. I'll post some photos of the renovate and after when I get em sorted and loaded online. This is the Pulpwood car before I started the overhaul... My grandfather had this piece on display on top of his dresser in his bedroom for years, I guess it was his only reminder of days gone by. And another car I have, it's a BADX anhydrous ammonia tank car with a few tagging's on it.... Looks like the outlaws caught up with that one... And thanks for checking out my work, really appreciate your comments too! Thanks!